Forget my drama-mamma...this afternoon's workout was much better. For one, the place was 1/2 empty. Much better for me. I went to the small room off to the side and found my preferred piece of equipment. 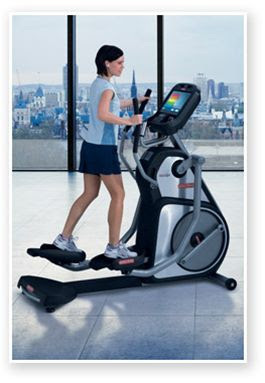 The Star Trac E-TBTe Total Body Trainer. Smooth compared to the treadmill. I watched the Food Network while I worked out and occasionally put on the stats page to see a full view of everything it was tracking. I started with the 7-minute warm up, then proceeded to the healthy heart, preprogrammed 20-minute workout. I must say that I didn't mind it so much. It was hard for me, but I haven't moved much since I was pregnant with Neviyah so that is to be expected. Still, it feels good to get moving and I am hopeful that my midriff will, er...decide to slim up a little! 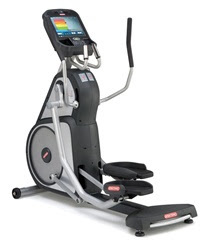 wow - that's an awesome looking elliptical. Was it at the J?